British Prime Minister Theresa May responds to the terror attacks in London that killed at least seven people. Eight people were killed and almost 50 injured when three Islamic State group-inspired attackers ran down pedestrians on the bridge, then stabbed people at bars and restaurants in nearby Borough Market on a warm spring evening. The three attackers were shot dead by police within minutes. The rampage came two weeks after a bombing at an Ariana Grande concert in Manchester Arena that killed 22 people. Survivors, politicians and emergency workers were attending a service Sunday at Southwark Cathedral near London Bridge. The nation will hold a minute of silence at 4:30 p.m., and the words #LondonUnited will be projected onto the bridge, which connects London's business district with the lively south bank side of the River Thames. May paid tribute to the bravery of first responders and others, including Ignacio Echeverria, a Spanish man who tackled the attackers with his skateboard and died in the attack. She said the fact that seven of the eight victims came from outside Britain — from France, Spain, Australia and Canada — was "a reflection of our great cosmopolitan capital, whose energy and values brings together people from across the world, and a tragic reminder that the threat from terrorism transcends borders and impacts us all." "Our resolve to stand firm and overcome this threat together has never been stronger," May said. Britain's official threat level from terrorism is "severe," the second-highest of five levels, meaning that an attack is highly likely. 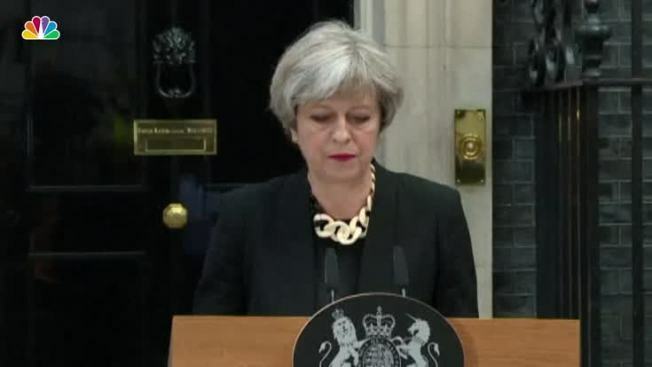 The government said Sunday that "we expect the threat from Islamist terrorism to remain at its current, heightened level for at least the next two years, and that it may increase further." It said the threat from extreme-right violence is growing. Home Secretary Sajid Javid said Sunday that he plans to recruit 2,000 new security service officers to help combat the threat.